Createspace Independent Publishing Platform, 9781499281101, 266pp. After her father's slow death from cancer, Carlie's mother is forced to sell their cherished oceanfront home and move the family to the other side of the tracks-to dreaded Las Pulgas. At her tough new urban high school, Carlie is nicknamed "Princess" because of her aloof attitude. But what her classmates don't know is that Carlie isn't aloof; she's in mourning for her father and almost everything else that mattered to her. Meanwhile, her younger brother Keith becomes angrier and more sullen by the day, and even their cat Quicken goes missing, sending Carlie and Keith on a search for her in the hidden orchard beside their seedy apartment complex. They're met by a rifle-toting cowboy who ejects them at gunpoint from his property. But when Carlie finds him in the kitchen having coffee with their mom the next day, having found and returned the cat, she begins to realize that in Las Pulgas, nothing is what it seems. A native Californian, C. Lee McKenzie, has always loved to write. But she's also been a university lecturer and administrator, and for five years, she wrote and published a newsletter for university professors. She's published articles on linguistics and intercultural communication, as well as on general magazine topics. Her fiction and nonfiction for young readers has been published in the award-winning e-zine, Stories for Children, and Crow Toes Quarterly has published her ghostly tales. 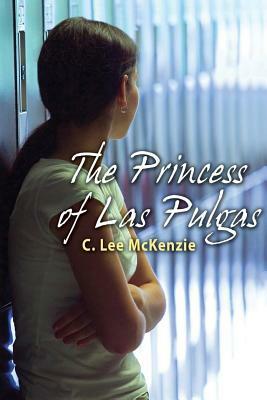 Sliding on the Edge was her first young adult novel, which was followed by this second one, The Princess of Las Pulgas. When she isn't writing, Lee hikes in the mountains in Los Gatos, California.